There are about 7 billion people in the world currently, and that number is projected to rise to about 8.9 billion by 2050. Assuming that each person consumes 1200 calories per day, this means that each year, the world consumes about 3066 trillion calories. Producing this massive amount of food is a problem that is not going away, and neither are the problems created by the growing of this food. The main problem with fertilizer is that it is not all absorbed by the farmland that it is intended for, causing runoff that can pollute natural bodies of water with excess nitrogen. In lower concentrations, nitrogen is actually necessary to sustain life within an ecosystem. When there is an excess of nitrogen, however, the system becomes overloaded with algae, which can cause problems. 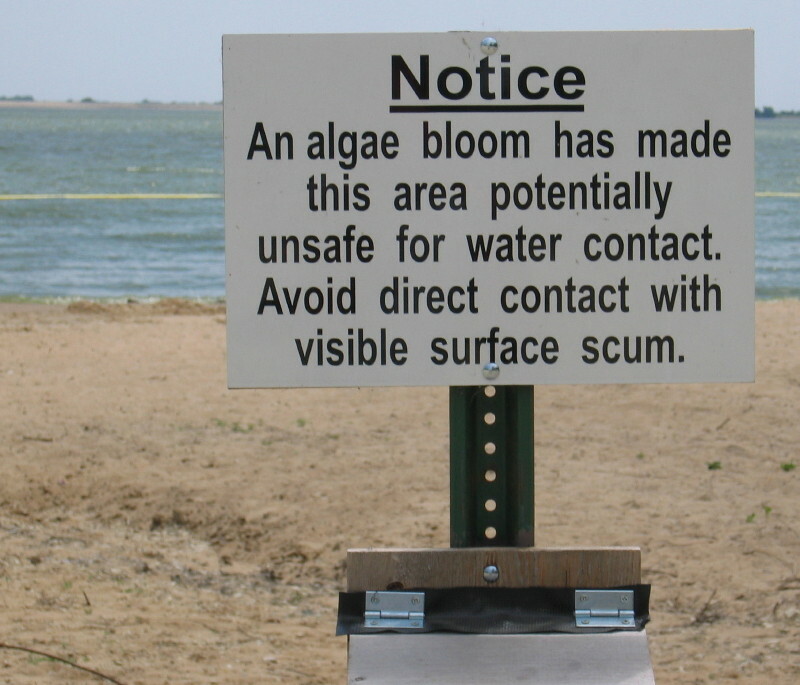 A sign warns swimmers about an algal bloom. This is an example of one of the negative repercussions that fertilizers can have. 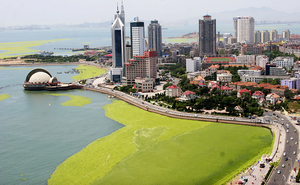 An algal bloom near Qingdao china. Blooms such as these are often caused by fertilizer runoff.
. Despite all of these problems, use of artificial fertilizer and pesticides/herbicides is still an extremely common practice. Why? Very simply, because other methods are not efficient enough. There are 7 billion people to feed, and not producing enough food is not an option. Crop rotation is nice in theory, but for a farm attempting to produce the maximum amount of possible food, it does not work, because it does not allow the farm to produce the same product on the same field every year. Pesticides/herbicides and fertilizer can be detrimental to the environmental, but for many farmers, they are a necessary evil. In an ideal world, we would be able to produce all the food we need without any ecological harm, but sadly, it is not economical to run a large-scale farm without using chemicals, and hence nobody does it. There are, however, many ideas about improving are farms. Improved laws and incentives aimed at increasing the sustainability of large-scale farms are one option. As awareness of the importance of protecting the environment has risen, so have technological innovations such as the N-Sensor a sensor that helps farmers to reduce nitrogen runoff, protecting the environment as well as saving money. Innovations and ideas such as this are the best way to combat the problems caused by large-scale farming.